In parallel with its population and GDP growth, Turkey has been experiencing rapid demand growth in all segments of the energy sector for decades. Turkey’s energy consumption of primary energy and electricity has increased at an annual average rate of 4 to 8 percent in the last two decades. It is expected that this trend will continue in the coming decades. In response, Turkey is developing an energy policy aimed at securing a reliable supply of energy, as well as to achieve a low-carbon and environmentally sustainable future. Turkey also intends to promote employment and economic growth through its energy development. 1311kWh/m².year (daily total is 3.6kWh/m²). The Southeastern (GAP) region boasts the highest solar energy potential in the country with 1460kWh/m2·year and sunshine duration of 2,993 hours per year (3). 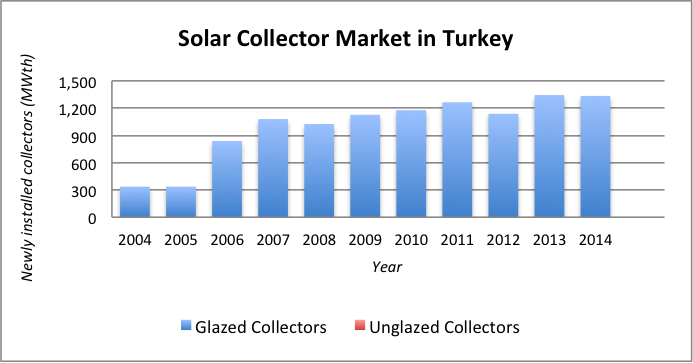 With nearly 1.9 million m² of collector area newly installed in 2014 (1.33 GWth), Turkey was again the second-largest solar thermal market after China. The share of vacuum tube collectors had increased significantly over the years, but stagnated in 2014 at 44 % of total market volume (4). The annual study Solar Heat Worldwide from Austrian research institute AEE INTEC (5) uses industry-based figures for Turkey. Although there are yet no regular official statistics by the government, GÜNDER (6), the Turkish Section of the International Solar Energy Society, along with GAP YENEV (7), Renewable Energy and Energy Efficiency Center at Harran University, have been collecting data from big part of the national solar thermal industry and Sisecam (8), only glass manufacturer for solar collectors in Turkey, for accurate prediction. According to the latest market surveys on solar thermal industry trends (9); multi-family houses were considered as the fastest-growing segment in Turkey´s solar thermal market, as stated by 52% of the survey participants. Another 17% considered single-family houses to be the most important segment, 14% opted for the tourism sector, 10% for the public sector and 7% for industrial process heat. · One year after the earthquake in the city of Van in the very east of Turkey, TOKI has built 15,323 new flats for those who lost their homes, with individual 120 litre thermo-syphon solar water heaters, corresponding to a total collector area of 30,646 m2 (2). · The high-security Silivri Prison is equipped with 3,500 m² of solar water heaters, and is Turkey´s biggest solar thermal project so date (2). Solar-combi-set, which combines solar water and space heating and works alongside gas boilers, are becoming popular reference projects for villas and particularly hotels. Large companies have strong interest since each project counts between 70 and 500 solar collector installations (3). Vacuum tube technology is gaining influence in the Turkish market (4). Between 2007 and 2014, the share of vacuum tube collectors among the total newly installed collector area in the country increased from 4 to nearly 44%. Thermosyphon systems with a vacuum tube collector, having 1.6-3.0 m2 area, have been very popular in recent years. Main market driver of the classical thermosyphon system with a single tank is its relatively affordable price, easy-payment protocol provided by marketing companies, regardless of being a large national-level company or a small local level company. Its efficient use due to high solar radiation potential of the country and relatively higher prices of conventional fuels are other reasons to widespread use of these systems. The market nowadays is very hot for a newly constructed industrial or commercial facility, because it can take just three or four years for a solar thermal system to pay back its installation costs, as opposed to the five-year payback time of natural gas. In the last five years, use of solar water heating systems based on vacuum tubes has increased remarkably due to its “lower price” than classic flat plate collector systems. The installer’s profit margin is also higher with vacuum tube systems than with flat plate collector systems. Besides, the installation of a vacuum system is simpler. Turkey has no incentive for solar water heaters except for families living in remote areas (“forest villages”) who receive interest free credit by covering 100% of the investment cost, which would be repaid in three equal installments. Between 2004 and 2013, 132,121 families lvining in rural areas have received a subsidy for solar water heaters from a project funded by the General Directorate of Forestry, Department of Forest and Village Relations (ORKOY) to avoid deforestation. Recent regulations on renewable energy use along with energy efficiency requirements (BEPD of Turkey) have created many opportunities for the solar energy and HVAC sector. The National Renewable Energy Action Plan of Turkey has supported this trend and set a new target for the share of renewables in gross final consumption for heating and cooling to 14.16% from 12.54%. Solar heating tanks are a common sight on the roofs of Turkish houses, even throughout the country’s less populous eastern and central regions. Keeping track of all these installed solar thermal systems is very difficult, however, because of the unofficial, decentralized nature of the industry. Of the several hundred solar thermal manufacturing companies in the country, there are 10 to 15 large companies, which are financially strong. The rest are small companies with three to four employees. The smaller outfits buy their raw materials under the counter so they don’t incur any value added tax, making their products about one-fifth cheaper than the merchandise of traceable large companies. Turkey is one of the few countries with a functioning solar thermal market that works independently of any subsidy programmes. In European countries and the U.S., the governments give incentives so people can easily afford solar thermal systems. If private residences in Turkey were given an incentive by the government, like only having to pay half the installation costs, then some standards could be applied to the market. The expansion of the gas grid to villages, which have been an important sales channel for solar water heaters, has negative influence on solar collector demand. The industry is well developed with high quality manufacturing and export capacity. It is estimated that there are nearly 90 manufacturers and 700-800 retailers throughout the country. Number of large manufacturing factories is 15-20. Almost all of these companies are involved with export and distribution activities as well. According to solar thermal market survey in 2014, there are 3 Turkish manufacturers (Ezinç Metal as 5rd, Solimpeks as 16th and Eraslan as 20th) in the top 20 list of worldwide largest flat plate collector manufacturers. Ezinç Metal is also ranked as the 2nd largest absorber manufacturer in the world (1). Evacuated vacuum tube collector manufacturers increased due to the fact that the import tax was implemented in July 2011, which made importers move system production to the country. Almost all of vacuum tube systems sold on the market today are made in Turkey. Three vacuum tube manufacturers have now become part of an export industry themselves. Lara Solar, Assolar/Aslanlar Metal and Solarsan all claim to have already been exporting vacuum tubes to different regions worldwide. Their manufacturing capacities vary between 3 to 4 million tubes annually (2-5). Total export share of solar water heaters has been increasing, varying between 10%-15% in recent years. Solar thermal systems are typically marketed to the end consumer by three-tiered chain: to wholesalers, who sell to installers, who sell to consumers. It is estimated that over 3,000 solar water heating system installers throughout the country exist in addition to 90 manufacturers and 700-800 retailers (1, 2). Solar thermal provides in total 20,000 direct and indirect (sub industry of tank, support base, fittings etc.) jobs in the country. Total investment cost of a typical domestic system including installation and all taxes varies between 500 -600 Euro. The total system cost for larger sizes is nearly 120-140 Euro/m2. Two solar thermal test and certification laboratories have recently been established in Turkey. Both laboratories will work to get accreditation for issuing the Solar Keymark certificate for solar water heaters. Solar buildings are just in R&D and demonstration phases and only passive solar architecture is mature in Turkey. There is no visible market as of now. The National Building Energy Performance Directive of Turkey on the other hand strongly encourages the use of renewable energy, especially solar in buildings (1,2). It promotes solar energy integration in Building Energy Certification. The ‘National Secure Green Building Certification’ by the Turkish Standard Institute (TSE) also remarkably counts solar energy use in buildings (3). Regulation of Energy Performance of Buildings. Published in Official Gazette with the Number of 27075 on 05.12.2008 (in Turkish). National Building Energy Performance Calculation Methodology. Annex I: Net Energy. Published in Official Gazette with the Number of 27778 on 07.12.2010 (in Turkish). Passive solar technologies (i.e., solar orientation, Trombe wall) are common in Turkey. Active solar cooling systems exist in a few hotels exist. Thermal storage is gaining in importance. Although the market is not formed yet, there are main reasons for the interest in solar integrated buildings. The most important market drivers are that buildings consume the majority of country’s energy and electricity/natural gas prices are relatively high. The existence of more nearly 9 million buildings, of which 90% are residential, in the country signals tremendous potential for solar energy integration. The National Building Energy Performance Directive of Turkey therefore strongly encourages the use of renewable energy, especially solar in buildings. A green certificate scheme is currently under consideration by the policy makers in Turkey. If applied, such a scheme can help subsidize the user of solar energy and reflect some of the external costs of fossil fuel-based power generation. A comprehensive study of the residential buildings and dwellings across Turkey was undertaken by the Turkish Statistical Institute for the year 2011. According to the study, 20% of the population resided in buildings with one floor, 19.5% of the population resided in buildings with 2 floors, 11.9% of the population resided in buildings with 3 floors, and 23.1% of the population resided in the dwellings located in buildings with 6 or more floors. The average number of floors in a building was 4. These numbers imply that almost 75% of the existing buildings are low rise, allowing much easier integration of solar thermal energy. Main key barrier in solar heating system application in buildings is that there is no incentive/support scheme by regulations. No credible information yet exists. Global Virtual Testbed Laboratory for Solar Buildings is being established by Harran University GAP Renewable Energy and Energy Efficiency (GAP YENEV) Center. The laboratory will be ready to test solar building components in 2017. Building Energy Performance Directive of Turkey promotes renewable energy technologies in buildings. Given that the measures/actions are due to come into force in the short/medium term (1 or 2 years) the promotion would be guaranteed, according to Draft version National Energy Efficiency Action Plan, published in 2014-December (National Energy Efficiency Action Plan of Turkey-Draft 7, www.eie.gov.tr/duyurular_haberler/document/UEVEP_TASLAK.pdf). Please also see the Support Framework section below for more information. Since 2004, 180 m2 of solar thermal parabolic trough collectors at a hotel in Turkey produce heat at 180°C to drive a thermally driven cooling machine and to provide steam for the hotel laundry. The cooling machine is the first example of a double-effect absorption chiller. It has a cooling capacity of 116 kW and a COP (Coefficient of Performance) of > 1,2. Back-up is provided through a LPG-fired conventional boiler (1). An innovative PV/T hybrid solar collector by Turkish manufacturer Solimpex was designed, tested and manufactured for commercial use. The patent application of the PV/T has been done and still in process (2). Baymak, offers a new system called Aqua Solar. The company paid special attention to the aesthetic appearance. The company modified the tank, which is protected from corrosion by titanium added enamel and magnesium anodes. New high UV resistant plastic side covers allow easy carriage and easy installation. The system is available with a storage capacity from 16 to 300 litres (3). Ezinç introduced a new solar water heater model called “Nanosol NA 130”. The system combines a solar collector and a 130 L enamelled storage tank in one unit. As a passive system in which the water is heated directly it does not need pumps, a separated storage tank or heat exchangers. Ezinç reduced the heat loss by placing the water tank into a special thermally insulated UV resistant box (4). This is achieved by encasing the water tank in a double layer ultra-high transmittance polymer-topped box that allows heat from the sun to reach the water tank. The water’s large thermal mass, along with the insulation reduces the heat dissipation outwards the tank. It also has an inbuilt back-up electric heating element of 2 kW for cloudy days with an adjustable thermostat in the integrated tank. This product won INTERSOLAR 2013 award in Solar Thermal Category (5). The purpose of this Law (1) is to increase efficiency in using energy sources by avoiding waste, easing the burden of energy costs on the economy and protecting the environment. This law covers principles and procedures applicable to increasing and promoting energy efficiency in the energy generation, transmission, distribution and consumption phases at industrial establishments, buildings, power generation plants, transmission and distribution networks and transport. It also raises energy awareness in the general public. • Develop an appropriate framework to promote the penetration of distributed generation based on renewable energies and the usage of renewable energy in buildings. The Turkish Government has a strong commitment to energy efficiency. This document (2) presents strategic guidelines and actions for creating energy efficiency in the building, transportation and industrial sectors in Turkey. It plans to enhance energy efficiency, preventing unconscious use and dissipation, and decreasing energy density either within the sectorial base or at the macro level. These guidelines form important components of the Turkish national energy policy, in all its stages from energy production and transmission to final consumption. A subsidy program has been prepared to provide KOSGEB’s support for the training, study and consultancy services to be received by SMEs regarding energy efficiency (pursuant to the Energy Efficiency Law No. 5627 and within the framework of the by-law on KOSGEB Subsidies). Scientific and Technologic Research Projects, Fast Support Program, Program for Supporting the Research and Development Projects of Public Agencies, Patent Application Incentive and Subsidy Program, Universal Researcher Program, Program for Participation in International Scientific Research Projects, Program for Supporting the Initiatives for Establishing Scientific and Technologic Cooperation Networks and Platforms and the National Young Researcher Career Development Program. Furthermore, TÜBITAK’s Technology and Innovation Support Programs Department (TEYDEB) is executing support programs for increasing the research-technology development skills and innovation culture as well as competitive power. The rate of support can be increased by 20 percent for projects with environmental technology themes. TTGV provides repaid financing support for the R&D activities at technology development level, by which products with commercial value are developed. The support covers R&D projects in the fields of environment friendly products, sustainable production technologies, renewable energy, etc. The Environmental Supports financed by TTGV provide repayable funding support to the “implementation projects” of industrialists in the fields of environmental technologies, energy efficiency and renewable energy. In addition, TTGV provides support for both the technologic innovation projects in Turkey and the initiatives for the protection of ecology. Within the framework of the Program for Supporting Environmental Costs being executed by the Undersecretariat for Foreign Trade, the costs of companies for ISO 9000 series quality assurance system certificates, ISO 14000 environmental management system certificates, CE mark and other international quality and environmental certificates are covered by the Undersecretariat for Foreign Trade. Energy efficiency projects with a budget of maximum 500,000 TL and recovery period of maximum 5 years are subsidized at the rate of 20 percent, with maximum subsidy level of 100,000 TL per project. Industrial facilities can sign “voluntary agreement” with General Directorate of Renewable Energy (YEGM) by committing to reduce their energy intensities by minimum 10 percent within a period of 3 years. For the entities which fulfill their commitment, 20 percent (maximum 100,000 TL) of their energy expenditures in the year when the agreement is signed is subsidized. The energy efficiency projects to be implemented at industrial facilities (with investment size above the amount determined by the Council of Ministers) and cogeneration investments (depending on fuel and technology) are entitled to benefit from the incentives provided by the Under secretariat of Treasury. In Turkey, the Ministry of Energy and Resources is the ultimate owner and entity responsible for disseminating all energy related information and manages this responsibility through one of its divisions specializing in Renewable Energy and Energy Efficiency, which is the General Directorate of Renewable Energy (YEGM in Turkish initials). Thus the General Directorate of Renewable Energy (www.eie.gov.tr), as mentioned in the above item, disseminates information on the internet which includes, but is not limited to, the benefits, costs and energy efficiency of equipment and systems using renewable energy sources for heating, cooling and electricity in a broad sense. Some academic institutions that have departments specializing in energy efficiency (e.g., Istanbul Technical University, Laboratory for Energy Efficiency and Lighting, Harran University, GAP Renewable Energy and Energy Efficiency Center, GAP YENEV in Turkish initials), some NGOs such as the Chamber of Mechanical Engineers, the Association of Energy Efficiency (ENVER) are also important entities that publish well researched and thoroughly analyzed information specifically on the net benefits, costs and energy efficiency of equipment and systems using renewable energy sources for heating, cooling and electricity. It is expected with the growing emphasis on efficiency from the General Directorate of Renewable Energy, that collaboration from the private sector and NGOs will be further increased. EPDB of Turkey promotes energy efficient renewable energy technologies in buildings. Given that the measures/actions are due to come into force in the short/medium term (1 or 2 years) the promotion would be guaranteed. Moreover, Energy Efficiency Strategy Paper aims at strengthening institutional structures, capacities and collaboration to increase use of state of the art technology, awareness activities and to develop financial mechanisms. The lines of action include the following topics: strengthen corporate structures and collaborations, training programs, R&D, agreements with consultancy companies, and communication and consciousness in the community. All these action lines would promote renewable energy use in buildings. Technical and quality measures based on international standards focused on renewable energy components, equipment and procedures must be taken into consideration, for example: TR-ISO 12975 for thermal solar energy (system and components). There is a strong solar energy association, GÜNDER (International Solar Energy Society – Turkey Section) founded in 1991, that maintains studies in the development of industry, science and technology in the field of solar energy by establishing the regulatory framework and raising awareness. GÜNDER is a unique non-governmental organization in Turkey that consists of administrators and civil servants of public bodies, academic members and industry representatives of Solar Thermal and PV, is the voice of solar energy by representing the entire value chain. GÜNDER is not only a member of ISES, EPIA and ESTIF, but also represents the Turkish Republic in the programs of IEA SHC and IEA PVPS.